S. Korea clinches overall men’s title while China grabs overall women’s title of the 2009 WTF World Taekwondo Championships held in Copenhagen, Denmark. 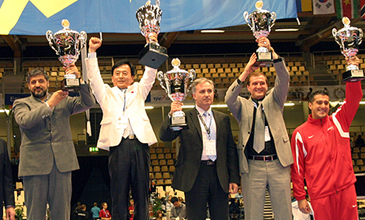 Korea managed to clinch the overall men’s title of the 2009 WTF World Taekwondo Championships, which concluded in Copenhagen, Denmark on Oct. 18, 2009. China grabbed the overall women’s title. In the men’s division, Korea won three gold medals and one silver medal for the top place in terms of total points, followed by Iran with one gold, one silver and three bronze medals. Spain came next with one gold, one silver and one bronze, while Turkey grabbed one gold and two bronze medals for the fourth place. The United States followed with one gold and one bronze. In the women’s category, China took home two gold medals, two silver medals and one bronze medal for the top place, while Korea stood at second with two golds, one silver and two bronzes. Spain came next with two golds and two bronzes, followed by France with one gold and one bronze, and the United States with one gold medal. It marked the first time that Korea failed to win both the men’s and women’s overall titles at the Championships. Mr. Steven Lopez of the United States was chosen as the male MVP of the Championships, as he became the first five-time world champion, while Spain’s Ms. Yague Enrique Brigitte was chosen as the female MVP as she became the three-time world champion. The Best Referee Awards went to Mr. Predreg Tesovic of Serbia, Mr. Faraj Alfadhel of Kuwait, Mr. Jung Kwnag Jun of Korea, Ms. Sandra Megally Pena of Colombia and Mr. Myung Chan Kim of the United States. WTF President Chungwon Choue also honored five best coaches of the Championships during the closing ceremony of the Championships. They were Mr. Sin Hak Min of Afghanistan, Ms. Myriam Baverel of France, Mr. Jorge Gomes Ramos of Mali, Marimer Lopez of Puerto Rico, and Mr. Alexey Zemischev of Russia. The Active Participation Prizes went to Greece, Turkey and Tobaco, while the Good Fighting Spirit Prizes went to Denmark, Senegal, and Trinidad and Tobago. On the fifth and final day of the five-day Championships, Korea won two gold medals and one bronze medal, while Spain clinched one gold and one bronze medal. In the men’s under 74kg division, Korea’s Joon-tae Kim defeated Canada’s Potvin Maxime for the gold medal. The bronze went to the United States’ Mark Lopez and Germany’s Mokdad Ounis. In the women’s under 62kg category, Korea’s Su-jeong Lim defeated China’s Hua Zhang to win the gold medal. Spain’s Estefania Hernandez Garcia and Thailand’s Chonnapas Premwaew shared the bronze medal. Spain’s Rosana Simon Alamo outpointed China’s Rui Liu to earn the gold medal. The bronze went to Korea’s Seol Jo and Brazil’s Natalia Silva.